An environmentally and socially responsible, sustainable cohousing community. 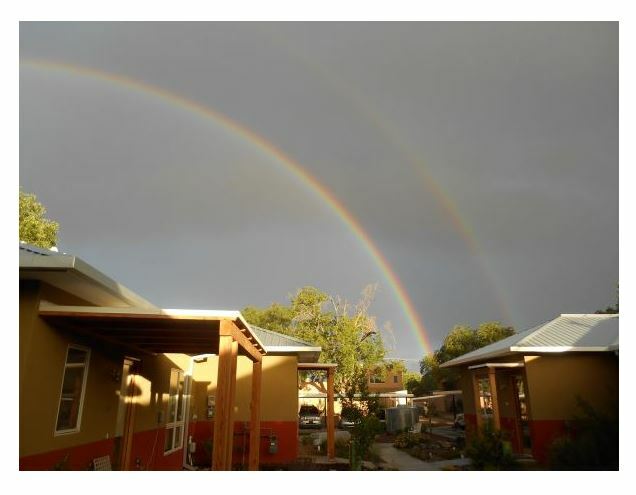 Our irrigated 1+ acre infill community is in Albuquerque's North Valley, next door to La Montanita food coop. Our homes are small--800 to 1200 sq. ft. and are highly energy efficient. There are 10 homes including the original farmhouse, part of which is our community space and guest suite. New homes are clustered around a courtyard, parking is in carport row near our large community garden. All owners are members with one vote per owner, and all work in committees to organize activities, manage and maintain the community. Decision-making is modified consensus--- Dynamic Governance. Our focus has been on having a thoughtfully designed, supportive community of singles and partners who will thrive in a nurturing, diverse and inspiring community. We aim to live more lightly on the land and welcome active adults who share those values.